Meet Per-Olof Arnäs, PhD and Senior Lecturer in ICT-based (Information and Communications Technology) transportation systems at Chalmers University, who loves the 21nd century and thinks that everything is better now compared with before. P-O is a digital evangelist and has been so for as long as I have known him. We talk about the difference between Digitization and Digitalisation, where digitization is when you create digital information, you have information already but convert it into a digital format, but digitalisation, that’s when you increase the use of digital technology to solve everyday problems for instance, or to create new opportunities. 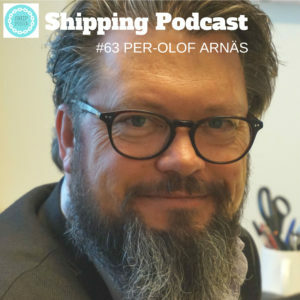 Of course, we go into a discussion on block chain, my latest craze and we talk about the times we live in how and how the maritime industry is adapting to them, or not. You don’t want to miss this deep-dive into all the digital trends we are living now, and you don’t want to miss listening to P-O. Give your opinion about what P-O is talking about, in any social media, Shipping Podcast is everywhere, or comment below. Thank you for listening, it’s my pleasure to make sure you don’t miss the paradigm we are in right now.